You might assume your dog is sad if you see his eyes filled with tears, but that's likely not the case. While dogs do appear to have a way of showing they're upset, they don't cry exactly the same way a person does. According to the Merck Veterinary Manual, dogs don't cry tears like people do. This is because, unlike humans, a dog's tear ducts are designed to drain into his nose and throat, not his eyes. A dog's physical system is not set up to associate producing tears when feeling pain. If you see an overflow of tears, this a sign of an eye problem or an allergy. In an article published at Vetstreet, Dr. Patty Khuly, VMD, says dogs don't sob the way people do when they cry, but they do express themselves vocally. When a dog wants something, feels anxious, or needs attention, he typically makes whimpering or whining sounds. This behavior is a dog's closest match to the human act of crying. Dr. Khuly also notes a dog may also make the same kind of noises when he's in pain, but this usually only happens when the pain is sudden. When a dog lives with chronic pain, he tends to suffer in silence most of the time. According to scientists at the University of California, Santa Barbara, dogs are more dependent on their hearing than their sight, so it makes sense that they have evolved to vocalize distress instead of crying tears. To date, there's no scientific evidence that dogs shed emotional tears like people do when they feel sad or upset. 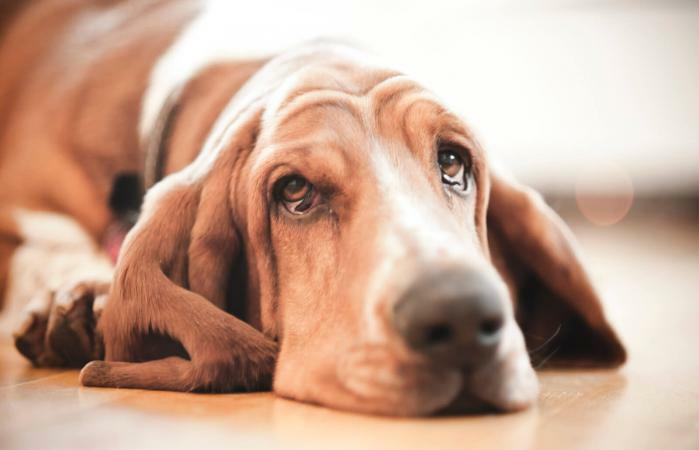 Dogs can often show body language that approximates what would be called "sadness" among people. While dogs cannot experience complex emotions like sadness, they can feel depression and anxiety. They can also feel what might be described as "love." Canine cognition and emotions have become a serious subject of research in the last several years and one such researcher is Dr. Gregory Burns. Dr. Burns' studies involve using MRI scanners to look at dog brains while they are experiencing feelings. They found that the areas of a dog's brain related to pleasure, similar to that of a human's, would become activated in the presence of objects with their owner's scent on it. According to researcher Attila Andics of the Family Dog Project in Hungary, dogs are the only species that actively makes eye contact with people. They also will instinctively seek out their human family when frightened or upset, just as a human child would seek his or her parents. Why Do Dogs Cry When They See You? A common sight on YouTube are videos featuring exuberant, crying dogs greeting owners who have been away for some time, such as service men and women returning from a tour of duty. In these instances, a dog is crying because they are overly excited and want to solicit their owner's full attention. Since dogs lack the ability to speak and language, vocalization is one of their primary ways of expressing excitement. Of course dogs will do this even if the last time they saw you was a few hours ago, but the intensity will increase with the length of time away and the relationship with the dog. What Does it Mean When Your Dog Is Crying? If your dog has watery eyes with excessive drainage coming from one or both eyes, one or both tear ducts may be blocked. However, flat-faced, large-eyed breeds like Shih Tzus, Pugs, and Pekingese may naturally tear more because of their unique head structures. Consequently, it's important to pay attention to their eyes and spot trouble as soon as possible. Conjunctivitis - This is an infection of the tissue that coats the eye, and it causes irritation, itching, watering, and tear stains. Corneal abrasions and ulcers - Infection or trauma damages the cornea and causes excessive tearing. A dog will usually keep the affected eye closed to help protect it. Distichiasis - Eyelashes grow abnormally on the inner edge of the eyelids and irritate the cornea. This leads to inflammation and excessive tearing. Glaucoma - This disease causes pressure to build up inside the eye, and it can cause blindness if not treated. Symptoms include excessive tearing and yellow discharge and enlarged pupils that don't respond to light. There are videos on the Internet that show dogs physically crying tears and associating this with emotions such as joy or sadness. The dog crying tears videos may tug at one's emotional heart strings, but the truth is these dogs are crying for reasons other than their feelings. It could be for any of the underlying conditions listed above or other eye disorders or injuries. Why Do Dogs Cry at Night? Many cultures have myths and legends featuring a dog crying at night superstition which is often associated with alerting humans to something dark and foreboding, such as the approach of ghosts, demons, or death. In fact crying after dark is not an unusual behavior. Crying and whining in the evening are common behaviors for dogs that are suffering from anxiety and stress. It's also common for young puppies to cry at night if they are kept away from you in a crate or outside the bedroom. Elderly dogs suffering from canine cognitive dysfunction may also cry more at night because their sense of confusion and disorientation increases when it's dark. Just because dogs don't shed tears specifically because they're upset, that doesn't mean they don't feel emotions similar to humans. They simply express their distress vocally. If your dog's eyes begin tearing excessively, and he seems uncomfortable, give your veterinary clinic a call and take him in for an exam as soon as possible. Your quick action may keep an eye problem from turning into something more serious.